Native plant seeds are eco-sourced and propagated at the nursery, and then the seedlings are returned to the same district from which they came. 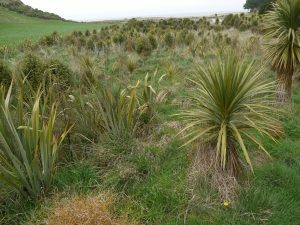 Hundreds of species are grown, including those which are prime material for perfect penguin habitat – New Zealand flax/harakeke (Phormium tenax), lemonwood/tarata (Pittosporum eugenioides), black mapou (P. tenuifolium), cabbage tree/ti (Cordyline australis), mikimiki (Coprosma propinqua), ngaio (Myoporum laetum) and koromiko (Hebe salicifolia). The nursery also grows the forest trees of totara (Podocarpus totara), rimu (Dacrydium cupressinum), miro (Prumnopitys ferruginea), matai (P. taxifolia) and kahikatea (Dacrycarpus dacrydioides). But it takes huge tenacity to germinate these future giants. It may take 18 months of watering and tender loving care before tiny leaf sprouts appear. 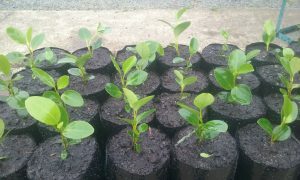 Propagation of extremely rare and endangered plant species is also a challenge met by the nursery. One recent example is the Cape Saunders rock daisy (Helichrysum selago), which has been grown from seed located with the help of a local farmer. Restoration of riparian strips provides ecological and environmental benefits for integrated land use practices, and is the way forward for conservation. Planting fenced off riparian margins not only improves water quality, but the area is made more attractive, habitat is provided for birds and insects, and stock are provided with shelter and shade along the outer fence. Download this PDF for helpful information on how you can get started rejuvenating a freshwater habitat in your community. For detailed information on planting riparian strips, contact your regional council. For example, the Otago Regional Council has produced an excellent booklet, Environmental Considerations for Clean Streams: a guide to managing waterways in Otago.